congatec has launched a range of modules using the 8th generation Intel embedded processors that support six cores for the first time. 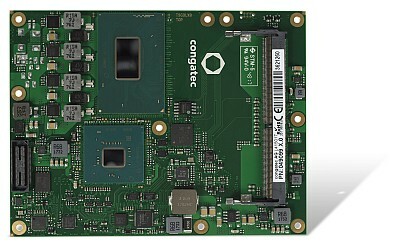 The conga-TS370 COM Express Type 6 Computer-on-Modules supports the Embedded Intel Xeon and Intel Core processors (codename Coffee Lake H). With a 35-45 W TDP thermal envelope, the COM Express Type 6 modules support up to 6 cores, 12 threads and a boost of up to 4.4 GHz, driving up to three independent 4k UHD displays. For the first time, designers can switch now from embedded Display Port (eDP) to LVDS purely by software without any hardware change. Initial tests from congatec indicate that these brand new six-core modules offer between 45 to 50 percent more multi-thread and 15 to 25 percent more single-thread performance, compared to 7th Gen Intel Core processor based variants. At a given TPD, system designs achieve higher bandwidth at overall lower power consumption ultimately leading to higher system efficiency. Target applications are high performance embedded and mobile systems, industrial and medical workstations, storage servers and cloud workstations, as well as media transcoding and edge computing cores. "Markets such as medical imaging and Industry 4.0 as well as video analytics for example for situational awareness and transportation observation are keen on any new performance improvement," explains Martin Danzer, Director of Product Management at congatec. "We simplify the use of these performance improvements with our standardized Computer-on-Modules, cooling solutions and eAPIs, making upgrading to the latest processor generations more or less a plug & play task." The modules have extended long-term availability of 10 years plus, high bandwidth I/Os with 4x USB 3.1 Gen 2 (10 Gbit/s) and Intel Optane memory support, as well as enhanced security features including Intel Software Guard extensions, Trusted Execution Engine and Intel Platform Trust Technology. The conga-TS370 COM Express Basic Type 6 Computer-on-Modules are available with six-core Intel Xeon and Intel Core i7 processors, or quad core Intel Core i5 processors in a 35 to 45 W cTDP envelope and up to 32 GB DDR4 2666 memory with ECC option. The integrated Intel UHD630 graphics supports up to three independent 4k displays with up to 60Hz via DP 1.4 , HDMI, eDP and LVDS. I/Os including 4x USB 3.1 Gen 2 (10 Gbit/s), 8x USB 2.0 and 1x PEG and 8 PCIe Gen 3.0 lanes for powerful system extensions including Intel Optane memory. All common Linux operating systems as well as the 64-bit versions of Microsoft Windows 10 and Windows 10 IoT are executable.